Throughout my life there's been one consistent passion, and that is fishing. I inherited my obsession from my Dad. Along the way I've discovered the only activity better than catching a fish is helping someone else land one, and that's why I guide. Nothing beats the excitement of putting folks on their first king salmon, giant lingcod, or huge halibut. The smile is from ear to ear, you can almost see their hearts pounding through their chests, and their hands shake for an hour afterward in response to the adrenaline. The stories get told and the memories last a life time. In the salmon we find an awesome blend of color, shape, and unbelievable speed and agility. Hunting these creatures has been my absolute passion for over 16 years and blood on the decks is what I live for. So come spend a day with Anacortes Highliner Charters in the San Juan Islands of Washington State, and you'll not only experience one of the most beautiful places on the planet, but I'll teach you how and where to fish for these incredible predators. 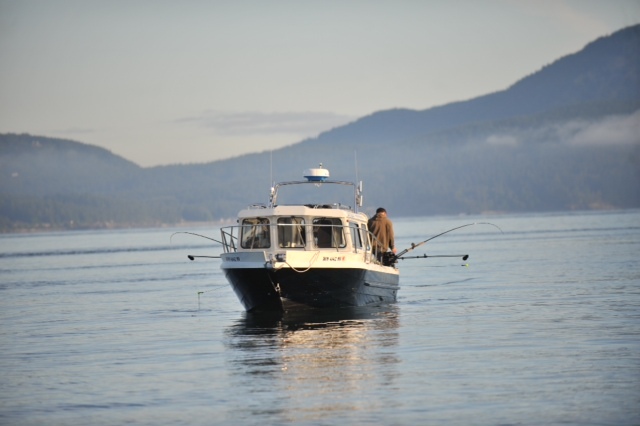 Now taking reservations for guided Salmon, Halibut, and Lingcod fishing charter trips in the beautiful San Juan Islands. We're located in Anacortes Washington which is 90 minutes north of Seattle and easily reached from Bellingham, Burlington, Mount Vernon, Whidbey Island, Camano Island, San Juan Island, and Lopez Island Washington. TripAdvisor Six years running as a Certificate of Excellence winner. Facebook Latest fishing photos, reports, and reviews. Yelp Reviews Read what the Yelpers are raving about. Google Reviews See for yourself what our customers think. Captain Brett Rosson is a retired Navy Pilot and Rescue Swimmer. He is Coast Guard certified, licensed and insured.